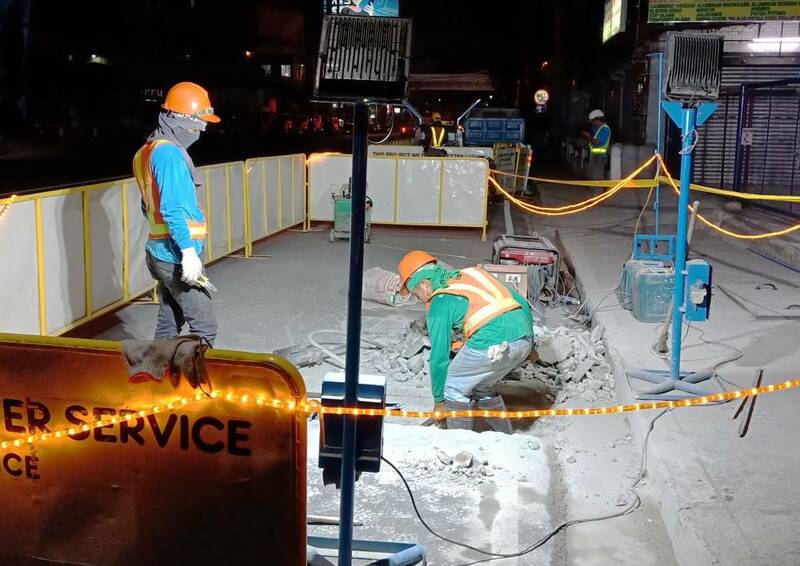 Manila Water undertakes pipe laying activities to allow for cross-border water sharing | Manila Water Company, Inc.
Manila Water undertakes construction activities along E. Rodriguez Sr. Avenue, Quezon City to allow for cross-border water sharing. Manila Water is currently undertaking pipe laying activities along E. Rodriguez Sr. Avenue, Quezon City, to allow for the cross-border water sharing between West Zone concessionaire, Maynilad and Manila Water in the East Zone. Maynilad committed to share up to 50 million liters (MLD) of water per day which will help alleviate the water situation in the East Zone. Currently, 12.73 MLD out of the 50 mld of water is being shared through the opening of a valves located at various locations in Quezon City such as at the corner of West Avenue and Bulacan Street, in Greenville Subdivision, in Carmel 5 Subdivision, and along Aurora Boulevard. The remaining 37 MLD of water will be shared by increasing the capacity of these cross-border pipes together with lines in 4 other identified locations in Quezon City. Manila Water scheduled joint inspections with concerned local and national government agencies in identified locations to determine construction and pipelaying activities to be done to allow for the cross-border sharing between the two concessionaires. Initial target completion of all cross-border projects is June this year but both companies are pushing for these activities to be completed by April, just in time for the energization of the new treatment plant from Maynilad.